Terrell was nominated for the award by the University of Arkansas’ Alpha Iota chapter of the national organization. Beta Alpha Psi is the international honor organization for financial information students and professionals. “This recognition is a testament to Terrell’s contributions to our efforts to develop leaders of the accounting profession and her commitment to student success,” said Gary F. Peters, chair of the accounting department and S. Robson Walton Endowed Professor. The Institute of Management Accountants sponsor each of the Business Professional of the Year awards and will present a plaque to each of the recipients at the annual meeting in Chicago on Friday, Aug. 9. Terrell will accept the award along with University of Arkansas students. The university chapter will be awarded $2,000. Beta Alpha Psi annually presents the Business Information Professional of the Year award to one professional each in education; industry and government; and professional services. Beta Alpha Psi chapters provide the nominations for this award to honor their own outstanding alumni members or honorary members. In addition to being an instructor in the accounting department, Terrell has taught students around the world, including at Soochow University in China, University College Dublin in Ireland and Duoc UC, a branch of the Catholic University of Chile. She was recognized for her innovative teaching by being the recipient of the Mark Chain/FSA Teaching Award for innovative graduate-level accounting teaching practices in 2016. 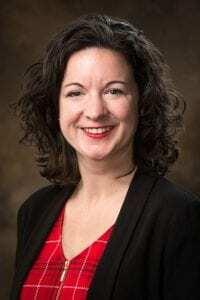 She has worked at Tyson Foods, where she held information system roles focusing on business analysis, project management for ERP implementations and upgrades and organizational change management.